Headlines: Very good reports have continued to come in from Eucumbene with both bank and boat anglers having excellent fishing. Even in the howling wind on the weekend anglers were catching fish! The lake has risen rapidly this week with the rain from the past week. Streams have had another top up with the rain late last week. We are open everyday except Christmas Day, over the holiday period. Rivers:- Mountain streams have had a good top up over the weekend with the Eucumbene flowing stongly. Levels will drop fairly quickly and will provide some god fishing over the next week. Weather and temps have been cool recently but with a return to some warmer days the dry fly fishing is going to be sensational. Dry flies to use at the moment are small emergers like Klinkhamers, Blue wing olive parachutes, attractors like Wullfs and Stimulators, along with beetles and hoppers. There have been alot of small hoppers showing and this augers well for the coming weeks. Other rivers to fish are the Thredbo, Moonbah, Mac, Snowy, Gungarlin, and a few other smaller high country creeks. Lake Eucumbene:- The lake is offically firing. It has taken a while but it has fished well again this past week. We have had plenty of reports of great fishing around the edges both during the day and evenings. 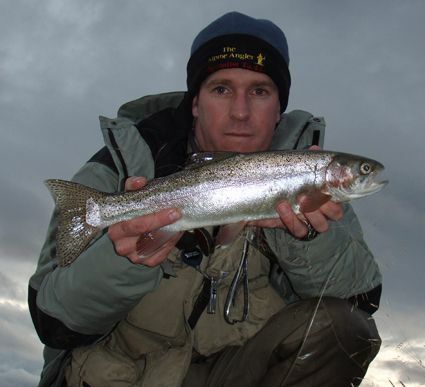 Conditions have been cool and windy which has made the fishing challenging at times, but there are plenty of nice rainbows searching the edges along with a few browns. Midges and Caddis have been the main insects hatching but there all sorts of food being taken by the fish. Snails, corixa, damsels, beetles, mudeyes have all been on the menu. Several anglers have reported midges balling and fish on them too. You need to find the areas where the fish are working. They are not everywhere. Shallower weedy, grassy soaks have been the best areas. Weather conditions play a big part and evenings with less wind will see more midges balling. There have been a few hoppers on the water and the trout are eating them also. Night fishing in the areas where fish have been working on sunset will produce some good fish too. Dark flies like Craigs, Fuzzies, Phantoms, are the go. Mudeye patterns will account for a few fish in the next week or two. *Leo Harding from Wollongong had an evening on the lake after work and cracked it with a ripper. 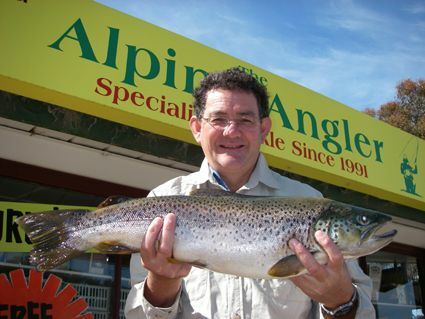 At 65cm and 3.2kg this brown is a really quality fish. 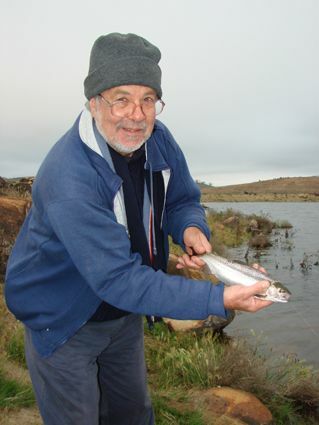 Fly was a black woolly bugger and the fish was taken in the Kalkite area. The fish is 7cm longer than the big one he caught earlier in the year and this will take some beating. King of the Illawarra Fly Fishers, well done Leo. Lake Tantangara :- A few fish have been on the go in the evenings and though not all big have provided some fun for a few anglers. *Dave, Phil and Wayne from Bega had a good few days fishing out of Old Adaminaby recently. They landed in excess of twenty fish. Trolling # 36 Tassies, Rapalas, Scorpions and Baby Merlins caught most of the fish. Coppermine Bay was the best area. The best fish caught was in a bait session and was a 1.75kg brown. White rocks, Anglers Reach and Coppermine areas have been very good. Top water lures like Tassies and small shallow minnows have been the beat overall but there are some good fish being caught deeper too. Baitfishing :- Mudeyes have been the key bait over the last week. 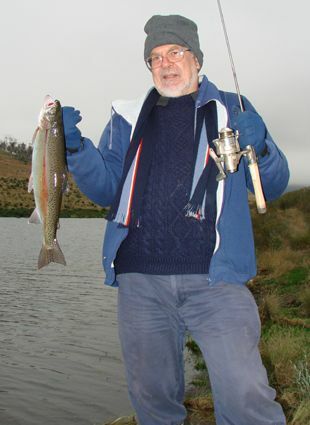 Fishing them shallow (less than a metre) has been the key for Eucumbene anglers. Powerbait and worms are still working but with all the insect activity the fish are looking up so a mudeye will he the best bet. Bait fishing has been excellent in Jindabyne with Gulp Power bait and standard Powerbait.